Windows Azure is Microsoft’s he cloud computing platform used for building, hosting and scaling web applications through Microsoft data centers. The open and flexible computing platform has been growing exponentially since its launch and this announcement is all the evidence you need. Microsoft, the software giant is offering a unique opportunity for startups by hosting a program, dubbed Microsoft Accelerator for Windows Azure. The program has been launched in India today with the sole aim to provide startups with the much needed support they need to innovate and become successful businesses. The 4 month long program will basically help early stage startups do big things in Cloud, Internet and mobile. It does not matter whether you want build your product, or turn your product into an effective business, Microsoft Accelerator for Windows Azure is providing you with all the essentials. 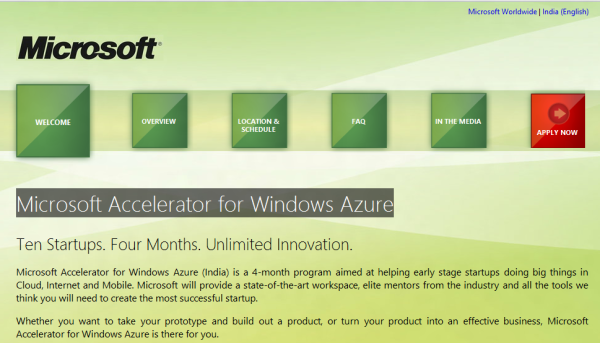 The Microsoft Accelerator for Windows Azure is not only open to the citizens from India but from abroad too. Any Start-up that can build any application using the Microsoft’s cloud platform and operate in any business or market segment is eligible to apply. Starting from today, Microsoft will receive online applications from startups till July 1, 2012. Ten applicants will be selected through screening process and will be invited to join the program in Microsoft’s office in downtown Bangalore, starting September 3, 2012. Selected startups will be required to be on the site full-time for four months and during this period they will get access to the all the resources of Microsoft’s BizSpark programme and $60,000 in Azure credit through the Microsoft BizSparkPlus program. In short, they will be provided with the workspace, infrastructure, mentors and the tools needed for their startup development. Microsoft has made it clear that it will not be taking any debt or equity from the starups as it believes in a clean process. The success of this program will be measured by the success of these startups. Microsoft will have no stake in these companies said Amit Chatterjee, Managing Director, Microsoft India (R&D) Pvt Ltd.
For contact information, visit here. To apply, visit here.